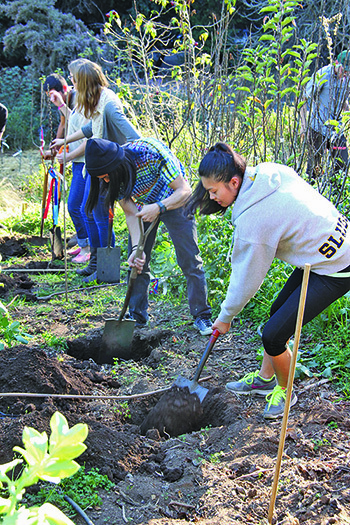 UCSC undergraduates are eligible for Measure 43 grants to support sustainable food, health, and wellness projects. Application deadline is Friday, December 14. Measure 43 grant funding supports student gardening activities. UC Santa Cruz undergraduates are encouraged to apply for grant funds available through Measure 43's Sustainable Food, Health, and Wellness initiative. Passed by undergraduates in the spring of 2010, the Measure 43 initiative is a student fee-funded program that ensures all undergraduate students have access to education and programs that enhance their understanding of the food system and their food choices, and that increase opportunities for classes, workshops, hands-on gardening experiences, and other campus activities. Measure 43's grants program makes funds available for undergraduate students to develop efforts that fit with the initiative's focus. This includes food system education and outreach events and programs, campus garden efforts, and student food system undergraduate research. Grants range from $500 to $2,500. Friday, December 14 is the deadline to apply for a Measure 43 undergraduate grant. Projects selected for funding will be announced on January 23, 2019. Please use the application form linked here. If you have questions, please email the the grant review committee by contacting the staff coordinator, Tim Galarneau at tgalarne@ucsc.edu or call 831-459-3248 or 831-359-8861.